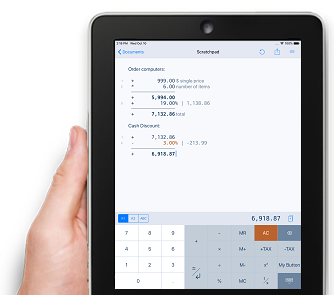 Calculate, comment, correct - Transform your iPad into an adding machine ! schoettler CalcTape is a revolutionary new kind of pocket calculator. With CalcTape, also extensive calculations remain clearly structured. CalcTape makes the arithmetic process visible - you can generate interim results and subsequently correct or change all numbers and operations. Enter many calculation terms in one turn and still keep an overview - like on an adding machine. Use interim results to check and structure your calculation. Send your calculations to business partners via e-mail. Create new functions and user buttons. Create your own keypad layout. Use the special keys for fast TAX calculations.